marys bites: Happy New Year 2011!!! I thought I would give you a little history as to why black eyed peas are thought to bring good luck by eating on New Year's Day. 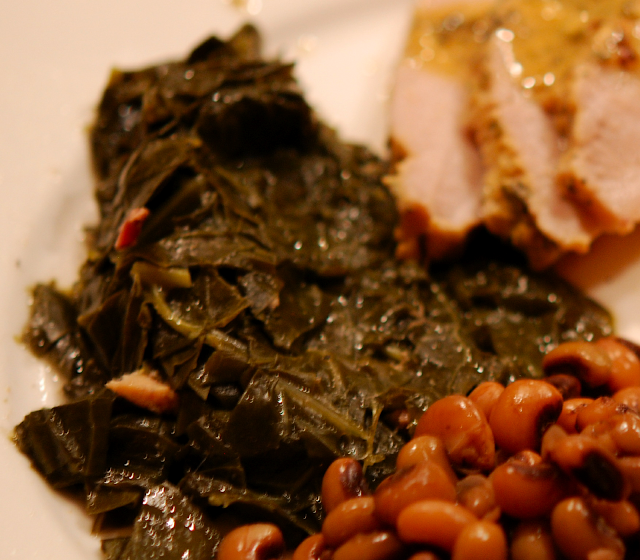 According to Wikipedia, the traditional meal features black eyed peas, collard, turnip or mustard greens and pork. 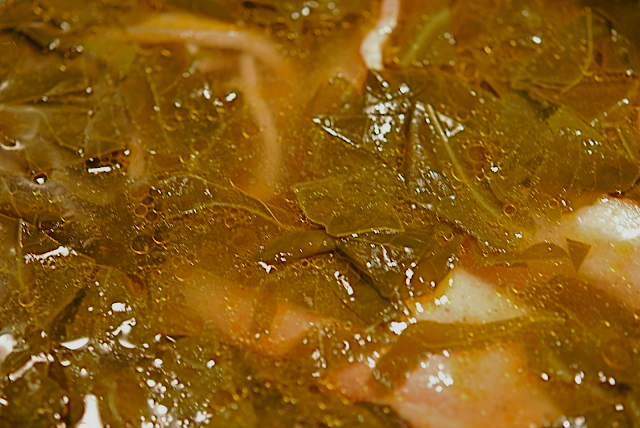 The peas, since they swell when cooked, symbolize prosperity and good luck; the greens symbolize money; the pork, because pigs root forward when foraging, represents positive motion. 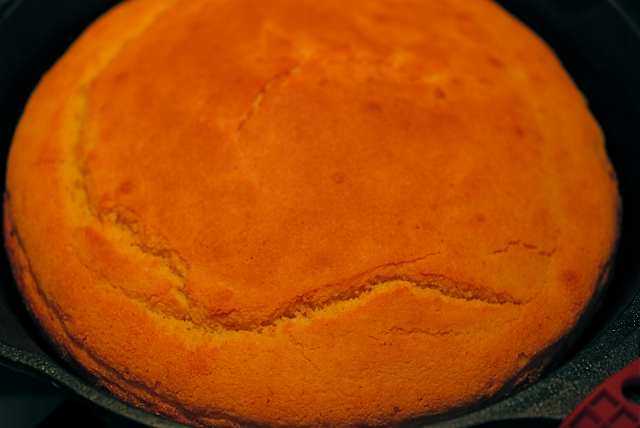 Cornbread often accompanies this meal. 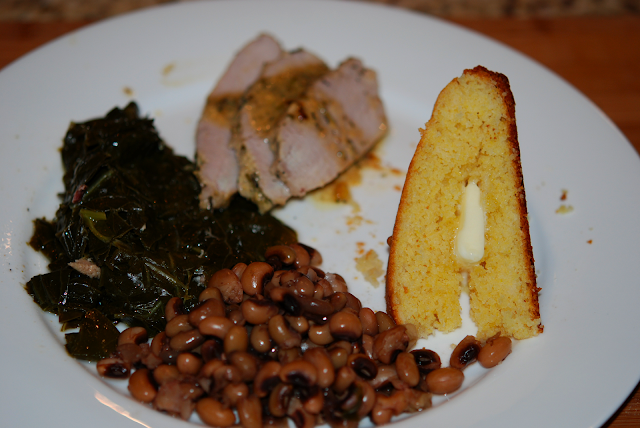 To be within the tradition of New Year's Day I have made black eyed peas, collard greens, pork tenderloin and corn bread. 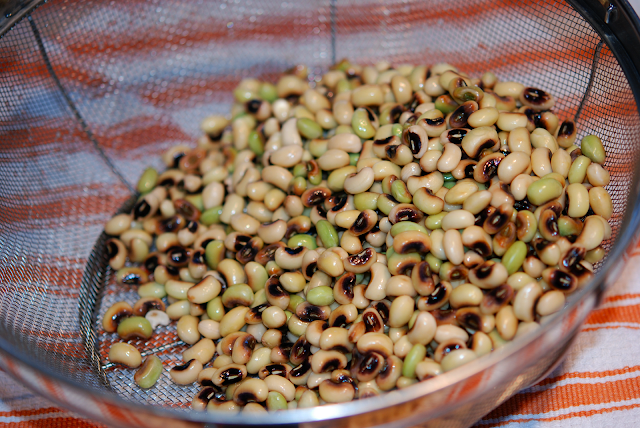 I hope that you have had a safe celebration of the New Year and lots of black eyed peas for good luck! Rinse Peas. Pick through and take out mushy peas and the bits. Rinse one last time and the water to a boil. Put peas in boiling water and simmer for 30 minutes, add additional hot water to keep peas covered during cooking. 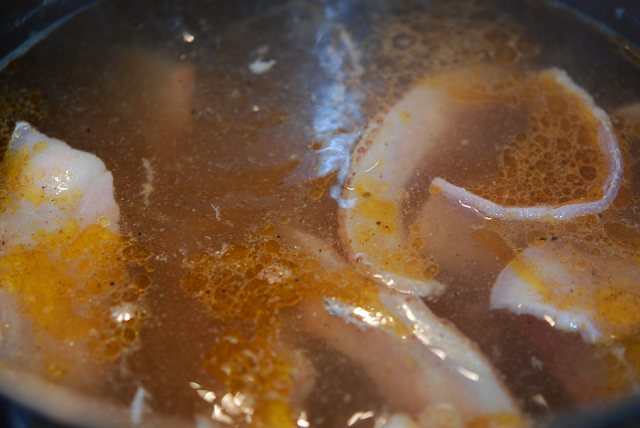 The water looks brownish as the begin to cook. Keep cooking at least for 1 hour before you taste the juice and peas. At that time you can add salt and the bacon. 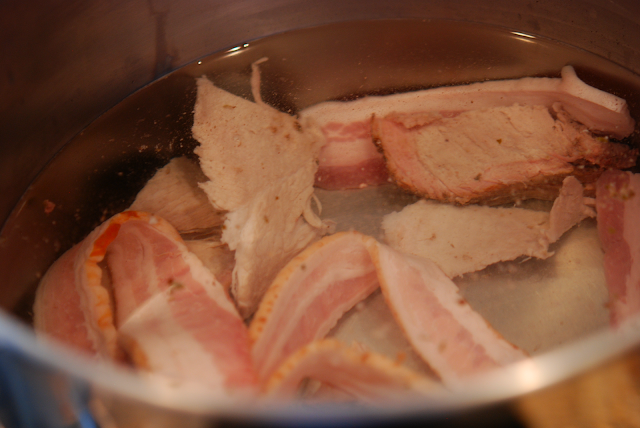 After you add the bacon, continue to cook for another 30 minutes. Continue to keep the peas cover with at least 1 to 2 inches of water. I always add hot water. Taste and see if the peas are done and your juice has cooked down and barely covers the peas. Rinse peas thoroughly. Pick through peas for soggy peas and discard unwanted matter other than firm peas. Take away any other strange objects, vines etc. Rinse peas again. Bring six cups of water to a boil. 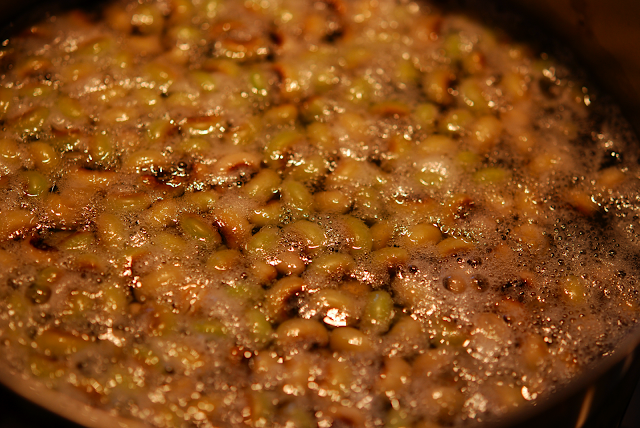 Add peas to boiling water and reduce to a simmer. Cook for thirty minutes. 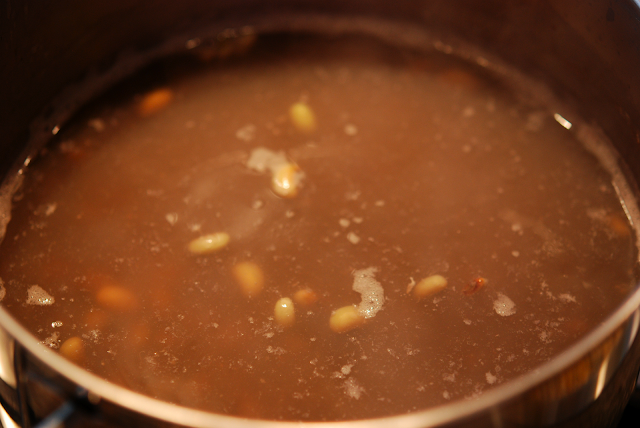 Add extra hot water if the water has depleted down to the level of the peas or below. (You want to maintain the water level above the peas about one to two inches). Cook for an additional thirty minutes. At this point you need to taste and add salt. Also add the bacon to the peas. Cook for another thirty minutes. You can season your peas with Worcestershire sauce and hot sauce if it suites your taste. Be sure not to cook down all your liquid. You need some to sop up with your cornbread! 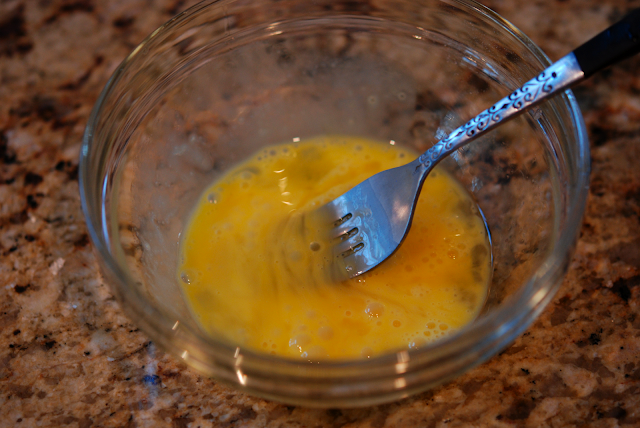 Add milk, egg slightly beaten, and oil to dry mixture. Beat until combined. Heat oil in skillet until very hot. Pour cornbread mixture into hot skillet and place into pre-heated 400 degree oven for twenty to twenty five minutes or until wooden pick inserted in center comes out clean. Preheat oven to 400 degrees. 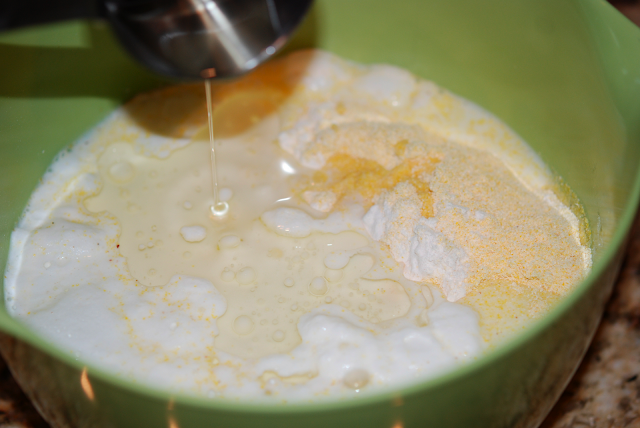 In a large bowl, combine corn meal, flour, sugar, baking powder and salt. Bake in greased or sprayed 8”cast iron skillet or baking pan. 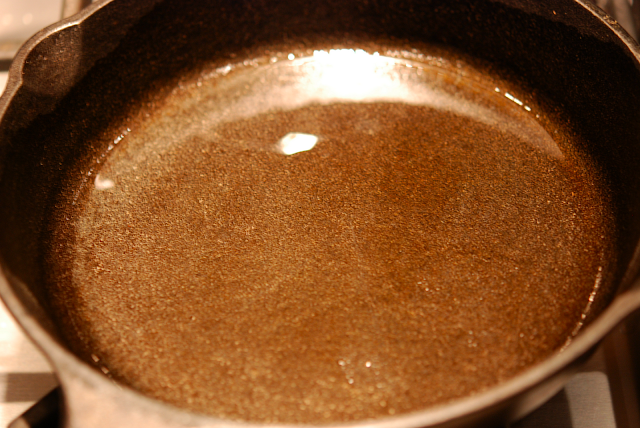 (I poured 1 tablespoon of vegetable oil into my 8” cast iron skillet and heated on the stove top until oil was hot.) Then I poured the cornbread mixture into the hot skillet and put in oven to bake for 20 to 25 minutes or until wooden pick inserted in center comes out clean. 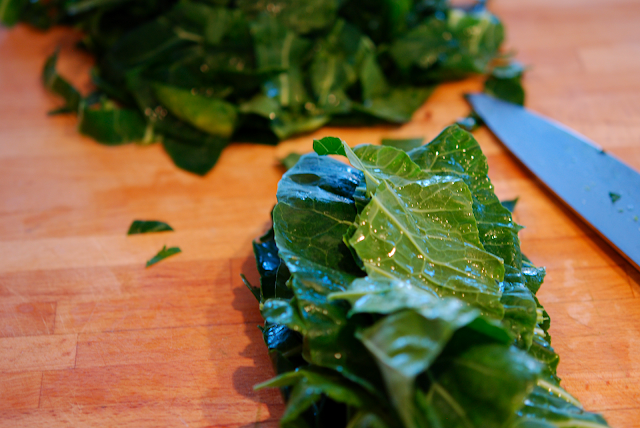 Ok, I'll admit that I have never made collard greens in my life! Since I am a true southern girl I had to remedy this gap in my culinary repertoire. So I started looking at recipes for collard greens and came up with one from Paula Deen. Mine slightly differs from hers but just a little. I was truly amazed how good they were and I did get Mr. B to eat his share. 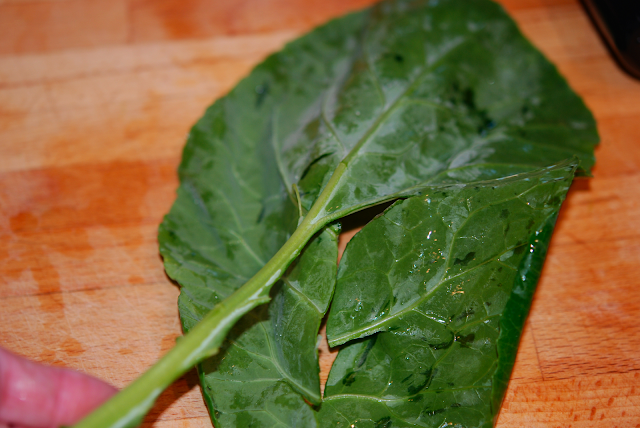 You have to understand he will only eat spinach raw, not ever cooked! 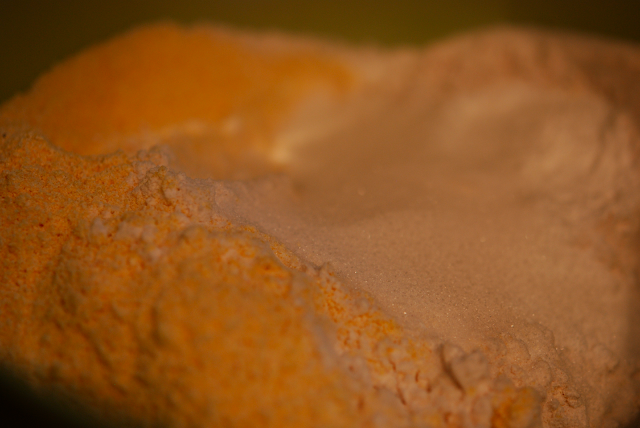 garlic powder, black pepper, salt and hot red pepper sauce. Reduce heat and cook for one hour. Stack six to eight leaves on top of one another, roll up and slice into one-half to one inch slices. Cook for another forty five minutes to one hour, stirring occasionally. When done, taste and adjust seasoning. I strained my greens and removed the meat. I don't know if that what I was suppose to do but I did it anyway! 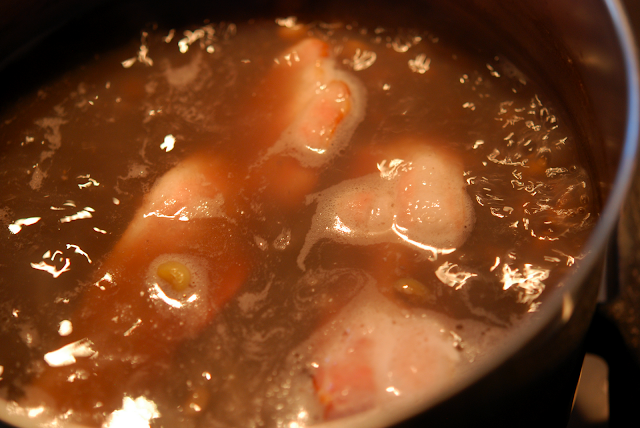 In a large pot, bring three quarts of water to a boil and add smoked meat, garlic powder, black pepper, salt and hot red pepper sauce. Reduce heat and cook for one hour. 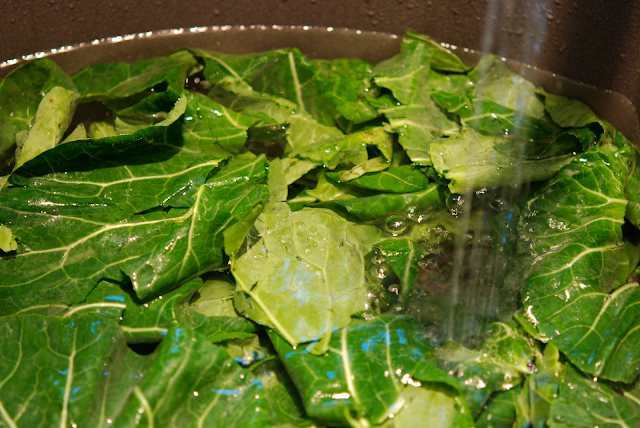 Wash the collard greens thoroughly. Remove the stems that run down the center by holding the leaf in your left hand and stripping the leaf down with your right hand. Stack six to eight leaves on top of one another, roll up and slice into one-half to one inch slices. 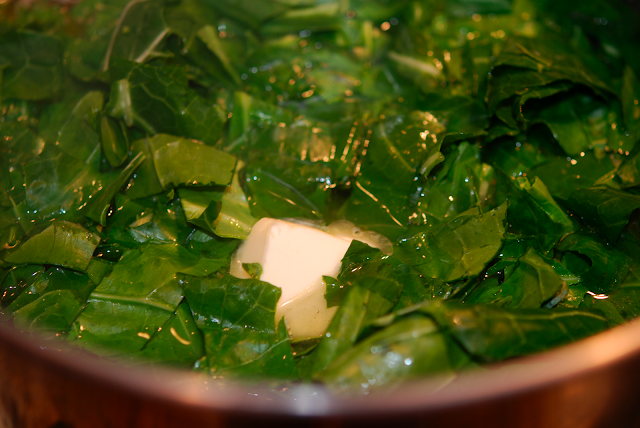 Place greens in pot with meat and add butter. 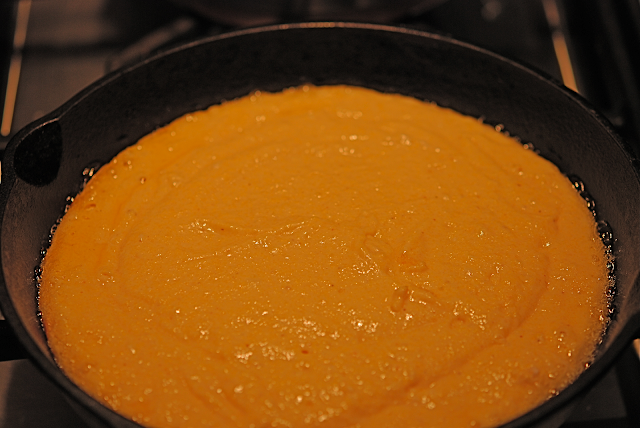 Cook for another forty five minutes to one hour, stirring occasionally. When done taste and adjust seasoning. Combine mustard, honey, wine, rosemary and thyme. 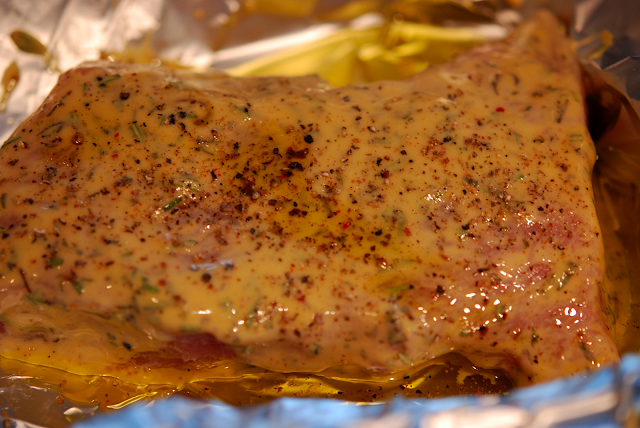 Coat the pork with mustard mixture and place in backing dish. Bake in pre-heated oven at 350 degrees for 25 minutes or until thermometer registers 160 to 170. 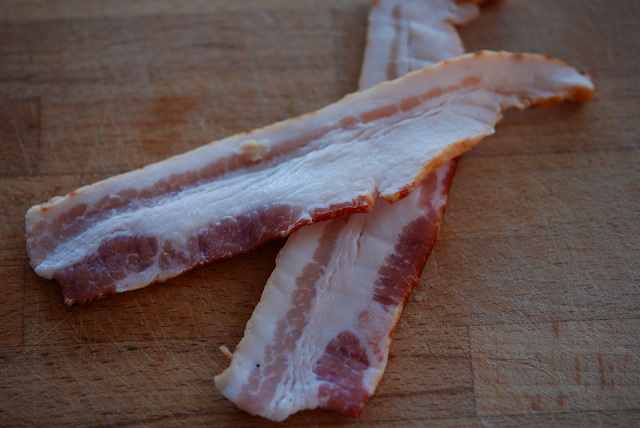 Trim fat from pork. Line a baking dish with foil and add olive oil.